Yamaha had the two best selling bikes in the UK last month. The YBR125 was snapped up by 328 people, while the YZR125 followed hot on its heels with 275 sales. Despite these strong sales, business is still slow with sales down 18.6% year on year, according to figures released by the MCIA. But its not all bad news, sales of naked bikes rose by 3.4% compared to September 2008, meaning they now have a 25.4% increase in market share. 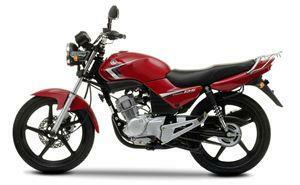 The most popular model in this category is Honda’s new CBF 125 M, closely followed by the Yamaha YBR 125. Between them these two learner-legal, commuter-friendly models have taken one-fifth of the market share within the naked style, with a combined total of 3,788 registrations year-to-date. Yamaha topped the manufacturer sales list with 2,233 registrations last month, leading Suzuki and Honda. Triumph registered 710 models.